Book Review: Salt Sugar Fat by Michael Moss (Part 1) about sugar where I learned that when a product says “fruit juice concentrate” on the label, it really means stripped juice — stripped of everything but the sugar. 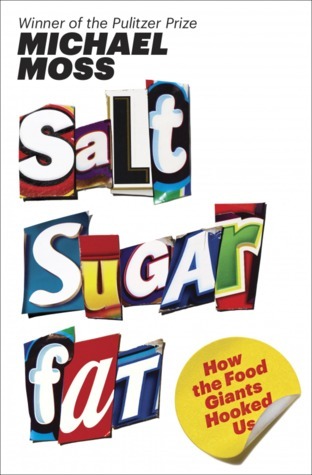 Book Review: Salt Sugar Fat by Michael Moss (Part 2) about fat where I learned that food producers have figured out that you can load up a food with fat and most of us won’t find it objectionable to taste (unlike sugar where there comes a point when something is just too sweet). Thoughts: The third part of Salt Sugar Fat by Michael Moss is about salt. And in some ways, this is the scariest. It turns out that most people can reduce their dependency on salt. After a few weeks of a low salt diet, your taste buds recover so that you lose your craving. The food industry, however, can’t reduce its dependency on salt because it’s doing too much for them, most notably masking the off flavors introduced by the manufacturing. Michael Moss sampled low-salt and no-salt versions of everything from Campbell’s soups to Cheez-Its and reported that they are inedible. Salt plays a big role in making processed foods addictive. The blood gets especially besieged when processed food is ingested, flooding the system with its heavy loads of salt, sugar, and fat. But where the links between eating and drugs gets really interesting is in the brain. There, narcotics and food–especially food that is high in salt, sugar, and fat–act much alike. Once ingested, they race along the same pathways, using the same neurological circuitry to reach the brain’s pleasure zones, those areas that reward us with enjoyable feelings for doing the right thing by our bodies. Or, as the case may be, for doing what the brain has been led to believe is the right thing. p. 276. There’s a lot in this section about food companies’ inability to take responsibility for the unhealthy aspects of their foods, even when individuals within the companies would like to. Time and again, attempts by one company to do the right thing are interrupted by its need to show an increase in profits every quarter to shareholders. I’ve always thought that corporations are disingenuous when the say that regulations are bad. Regulations level the playing field so that companies can do the right thing without getting crushed by competitors who are willing to do the wrong thing. Like the rest of us, I suppose, companies don’t like change. There’s also, according to a quote from the former chief scientist at Frito-Lay, a macho attitude that says “Keep your hands off my company.” Unfettered capitalism doesn’t serve us well in the areas where the greater profit competes with the greater good and a macho approach isn’t going to get us where we need to go unless we redirect that energy into a determined effort to solve problems. Even with smart regulations, though, it’s not entirely clear that industrialized food can be made healthy, as Michael Moss learned while visiting Nestlé’s research center in Lausanne. Here is a good point to address the recent article in The Atlantic by by David H. Freedman, “How Junk Food Can End Obesity.” Let’s start by noting that the food items he criticizes are prepared in restaurants or packaged. He’s not the first to point out that many foods you’ll find in the aisles at Whole Foods aren’t necessarily healthy or even whole — there’s a great passage in Drop Dead Healthy when nutritionist Marion Nestle walks around a Whole Foods store with A.J. Jacobs (Book Review: Drop Dead Healthy by A.J. Jacobs). If Freedman thinks that the Pollanites (as he derisively calls Michael Pollan, Moss, and others writing on this topic and those of us who read them) are promoting those foods for every day consumption, he’s not reading carefully enough. Whole Foods and the food manufacturers (some of which are owned by Big Food) are pushing those products, not nutritionists and health journalists. People who talk like this don’t understand how expensive addiction is. I used to think nothing of spending 7 or 8 bucks for treats from Walgreens or the drive-through at Jack in the Box in the middle of the afternoon and not even calling it a meal. You only have to do that a few times a week to bust a food budget — in fact, I counted that sort of expenditure as “entertainment,” since it cost about the same as a matinee movie ticket. When I quit eating the foods that triggered those cravings and made behavioral changes to counter my addictive tendencies, I eliminated that expense. I spend less on food now because I eat less of it. Yes, I get fewer calories per dollar by buying vegetables instead of potato chips, but I was eating too many calories before so that’s not a problem. If you want to know how to eat healthier on a budget, I love the Save Money on Groceries series at A Black Girl’s Guide to Weight Loss. There are links to all her posts at the end of this one: Save Money on Groceries: Buy it in Bulk. I hope that Freedman is right and Moss is wrong and there are healthier products that can be made by the food industry, although a description of a masticating robot in the Nestlé lab that could barely get through a serving of high-fiber yogurt was discouraging. If you want to lose weight while eating healthier processed foods, I can recommend a book right now: The Thin Commandments by Stephen Gullo which includes a long list of commercial foods in the back that have worked for his clients. It still takes a lot of attention and a conscious choice to eat certain foods and avoid others. I’m skeptical of claims, like those in Freedman’s article, that adding supplemental nutrients to processed foods makes them healthier. The same issue of The Atlantic has an article called “The Vitamin Myth” that argues that supplements, including multivitamins, do more harm than good. Do we really think it’s any healthier to add supplements to food? My understanding is that we don’t yet know enough about nutrients in isolation to do any better, and often do much worse, than what nature provides in whole foods. I want to learn more. Freedman thinks the food industry can solve the obesity problem among the poor. According to Moss, the food industry thinks it can solve the problem of how to feed the nine billion — the population estimate for the year 2050. I’m unconvinced. So is Dr. Yoni Freedhoff, founder of the terrific Weighty Matters blog, who wrote a response for US News and World Report, Why Junk Food is Unlikely to End Obesity, that explains the bizarre effects that health halos around foods have on people. Appeal: Salt Sugar Fat by Michael Moss is for anyone who thinks about food, whether it’s what you’re going to eat today or what the whole planet is going to eat in 2050. This is my post for Weekend Cooking. Check out Beth Fish Reads every Saturday for links to book reviews, restaurant reviews, recipes, and other culinary adventures. This sounds like a book I would really like. You make a great point, Joy–eating healthier is so much less expensive than eating processed foods. Tracking expenses, we realized eating out of the house was about 3x more per meal than eating at home — and hardly ever as satisfying. Making eating out (including lunch) a rare treat has had a great effect on our budget! Thanks for the review. Salt. Yes. Once you stop using salt, you’ll find most commercial, processed food and restaurant food way too salty. You’ll wonder where the flavor of the food is underneath all that white stuff. What a thorough and thought-provoking review. I’ve had this book on my to-read list for a while and saw the author on The Daily Show a few weeks ago. I definitely want to read this book even more now that I’ve read your review. Thanks for the link to the Atlantic article. I think Freedman has a couple of good points, but his constant mocking referrals to “Pollanites” and how elite and naive they are was extremely grating and alienating. As you pointed out in your review, Freedman misrepresents the views of these prominent food journalists. I’ve read Pollan’s In Defense of Food and am currently reading Bittman’s Vegan Before 6. Freedman wrongly conflates their views with various products on the shelves of Whole Foods and similar stores. Both Pollan and Bittman have a nice flexible approach to diet that I appreciate and their main points are to eat more vegetables, fruits and whole grains and less meat and junk food. They also emphasize cooking at home, so Freedman’s emphasis on restaurant food is also misplaced. In fairness to Freedman, Freedhoff’s response in U.S. News & World Report doesn’t seem to have fully comprehended Freedman’s article. Freedman also talked about the “healthy halo” effect in his article, but without using that phrase. Instead he talked about how the fast food companies are *not* trying to boast about the healthy aspects of their more healthy options, because of such marketing failures as the McLean Deluxe. Anyway, I find the topic of public health and the food we eat to be really interesting, so thanks for making your review of the book into a three-part series. This has been an excellent series of reviews, Joy. I’ve decided to listen to Salt Sugar Fat and am close to the top of my library’s hold list. I’ve found your series of reviews on these books very interesting over the past couple of weeks – thanks for breaking down what you found interesting/useful and what’s not so useful (the linking is great). This is such a thoughtful review. Your three part series has been so informative and well done, there is so much to ponder. Sounds very informative, I’m always on the lookout for new info. I’ve long been a fan of ‘clean eating’ but it’s taken some time to give up most packaged/processed foods. I’ve had hereditary high blood pressure from a young age and while reduced salt has had little effect on it, I’m sure other health benefits are a positive! What a fascinating review- I love it that you made a three part review of this book, I will have to go find the first two parts. I really enjoy this sort of book too, it’s so important for us to think about our food, read and act on a personal level, and also of course on a societal level. excellent review and comments. I had seen this book, but this is the first review I have read. Must get my self a copy of this. I have been a low salt person for years and find that restaurant foods and packaged stuff is just too salty. I do try hard to cook from fresh at home, but it does get difficult and out favourite meal is sushi and making sushi at home is not for me. Soup is one of the best items to make at home, it can be almost no-salt where as any store bought stuff has too much salt in half a cup. I do like a tiny sprinkle of salt on sliced tomato, but that’s about the only time I sprinkle it on. If I fry potatoes, I sprinkle on a home made spice assortment instead of salt. It’s not missed. Sugar is my weakness. I love sweets, specialy dark chocolate, though I can stop myself at one square.